More and more football teams are backing Blue September - and you don't have to play in blue to be blue. As well as leading players lending their names and voices to the campaign, many clubs have organised Blue September themed match days. Oldham Athletic held a Blue September themed match for their game at home against Brentford. The club had a photoshoot featuring first team players, the youth team, manager and assistants all with blue faces. On match day the cheerleaders and catering staff carried on the theme and there as face painting for fans at the ground. In Portsmouth, Pompey fans took Blue September to the streets prior to their game with Blackpool. 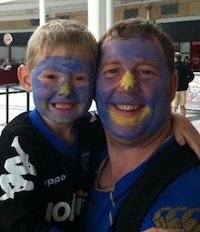 Fans met at the Spinnaker Tower in the city to get their faces painted blue and march to the game. The first ten fans to arrive suitably painted got a free match ticket. There was also a message from Blue September supporter and former-Pompey player John Aloisi played on the big screen pre-match and a bucket collection was planned at the ground with proceeds going to the Forum. Crystal Palace got in on the act too at their home game against Middlesborough. They devoted a page of the match day programme to Blue September, had facepainting at the ground, content on their website AND a competition to win a signed Palace shirt. All fans had to do was identify the player in the blue morph suit below. Can you? More on the Palace website. Main malehealth Blue September page.